By now it isn't a secret anymore that I am working on a port of Moon Cresta for the ColecoVision (hopefully in time for the 30th anniversary). Here are the first couple of screenshots, from BlueMSX. The attract sequence is already running, but I want to fine tune it a bit before posting a video. Moon Cresta was released in 1980 by Nichibutsu in Japan, then got an US release as "Eagle" by Centuri. Eagle has slightly altered graphics compared to the original Moon Cresta though. 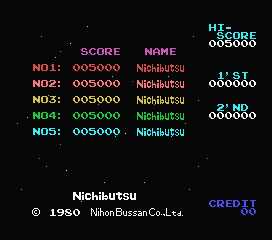 I am not 100% sure but I think Moon Cresta was also eventually released in the US by Nichibutsu themselves as well as possibly Gremlin/Sega. 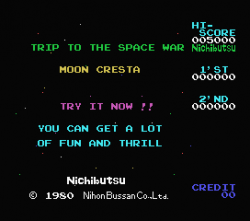 Moon Cresta was very influential at the time because it created the concept of docking two "lives" together to increase firepower (something Galaga later also used), as well as being one of the first shooters to introduce the concept of stages with different enemies. Is that the box for a home version of Crazy Climber? If so, for what system? KLOV says the aliens drop bombs in Super Moon Cresta. 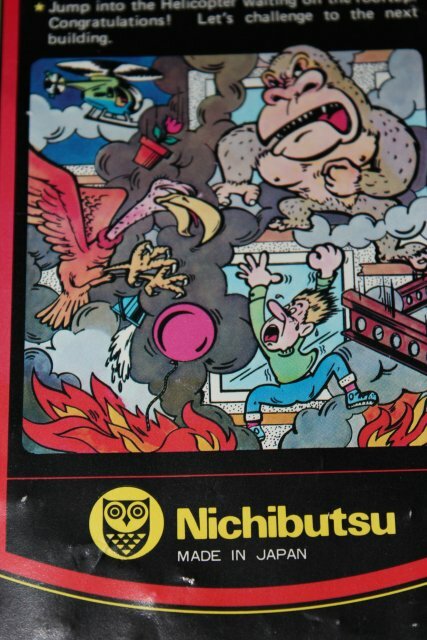 As if Moon Cresta or Eagle aren't hard enough, as the other member said, in Super Moon Cresta the bad guys drop bombs on you. I play Eagle mostly (instead of Moon Cresta). It's a tough and frustrating game with bad collision detection. My high score is 52K and I haven't been able to beat that over the last year. I guess I plateaued. In any event, I'm glad to see this game finally ported to a classic console. Yeah, that's what I used to play. I've never heard of 'Eagle' before. edit: @opcode: looks good so far. Good luck with it! Edited by Knubberrub, Fri Aug 19, 2011 2:38 AM. Very happy to read you are working on this old shooter. Actually I play it on my SNES (Nichibutsu collection) and hope to get yr. copy as soon as possible. I suppose it depends on locale and what distributor was servicing the area. My arcade had Eagle and one of the department stores also had Eagle. Opcode has just givin' me a lot of fun and thrill! Crazy Climber would be fantastic! The thing that got me interested on Crazy Climber is that it requires only 1KB of RAM, which means it could run on the plain vanilla CV... That and the fact it wouldn't be too hard to have smooth scrolling in that game. Indeed, but the downside is the twin-joystick control scheme of the arcade game. I suppose you'll implement an equivalent system with only one joystick? but wait, doesn't the roller controller hold two js? can they both be read at the same time? Good point! I brought this up for the control scheme for the possible development of Wild Western. There are a number of two-player simultaneous games for the ColecoVision, especially the sports titles, so reading two player input simultaneously on the ColecoVision is definetly possible. The Atari 5200 has the joystick coupler for games like Space Dungeon and Robotron, so why reinvent the wheel when we already have the Roller Controller available to us... although a smaller coupler that does not require all the extra wires and power hookup would be nice. 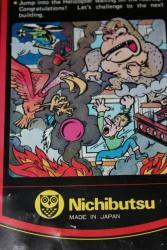 Can this be played on regular ColecoVision or will the require the Super Expansion Module? I never saw Eagle, only the Sega/Gremlin licensed Moon Cresta. Yeah, the "A lot of fun and thrill" line is classic video game Engrish. Got nothing on Zero Wing, though. I have never played the arcade version, but back in time i used to play it on my C64. It was really fun. It has been also ported on Zx spectrum and Amstrad CPC i think. Looking foward to see your rendition of that game on colecovision. Both should be playable on the regular ColecoVision. I picked those games because I wanted to be more inclusive in the 30th anniversary. [EDIT] The idea of using the Roller controller as a holder is pretty good actually. Since we don't need roller functions, we don't need the power adapter, we can connect both joysticks directly. Edited by opcode, Sat Aug 20, 2011 8:15 AM. The idea of using the Roller controller as a holder is pretty good actually. Since we don't need roller functions, we don't need the power adapter, we can connect both joysticks directly. Really? There's no extra power needed when using the Roller Controller as a simple controller pass-thru? Anyway, using a Roller Controller this way is definately a good idea in itself, but not every CV fan has a Roller Controller in the closet or attic. You may need to offer a single-joystick option. I fact, it should be the default option, with the dual-joystick mode available in the options menu. I don't think a single-joystick option is such a good idea. Have you ever tried the arcade version? The fun (and challenge) of the game comes from the dual-joystick control scheme. it's been a long time since I played the arcade game, is there some way you could use the number pad to control up and down 1 and 7 for left hand up and down 3 and 9 for right hand up and down and use the JS for left and right movement? I get that, but still, people only have two hands, and most CV fans don't own a Roller Controller.